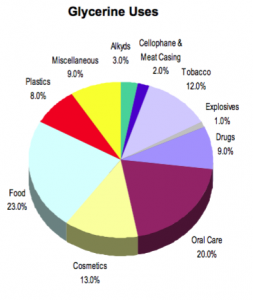 More than 2,000 existing uses in the personal care, food, beverage, tobacco, pharmaceutical and chemical industries. New uses of glycerine in the production of propyleneglycol, epichlorohydrin and PLA (biodegradable plastics) will double current global demand for refined glycerine within 5 years. Future, Natural Chem may add production of propylene glycol from glycerine at the Clinton Eco Fuels Plant. A pie chart reflecting glycerine uses. 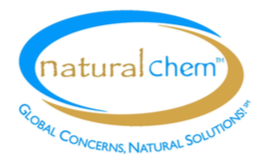 The Natural Chem Process provides one of the best paths to bring large quantities of new glycerine into the market that will be necessary to commercialize new applications. About 3 billion PPY from traditional sources such as soap, personal care and biodiesel manufacturers. Glycerine is a byproduct of “oleochemical” processes.